Have you ever wondered, how cool it would be to play your favorite land based casino games at home. StarGames offers the players casino games from the Austrian software provider Novomatic Greentube. Play all your favorite video Slot games at home for real money, like the famous Book of Ra, Lucky Lady’s Charm, Dolphins Pearl and many other great slot titles. Best of all, of course, is their minimum deposit of €10 only with Neteller, Skrill and many other great payment methods. 100% Deposit Bonus up to €100! Find the best Novomatic Online Slotgames like Book of RA and the well known Lucky Lady's Charm. There is also a wide range of table games like Roulette, Blackjack, Baccarat, and Keno. Also, Video poker and Bingo fanatics can play for many hours and enjoy the wonderful Stargames unique atmosphere without downloading the software. Looking for a Live Dealer Game to play? Well at Stargames they have a special Live Dealer section where you can play Roulette, Baccarat, and Blackjack. If you want to play at Stargames on your iPad or Mobile Phone, well on their web page they have a special QR code plus more details on how to play on your cell phone. Players can play for real money but also offers the player the Stargames Stars. You can buy these stars in packages for a few dollars and lets you enjoy the games for fun. I understand if you find it weird that you can have to buy your fun play credits. At other Casinos, you can play for totally free. New players receive 5000 Stars in their account, to enjoy the great novomatic games for free. Your Stars will be automatically credited to your casino account, so you can start playing right away. If you had enough of your free Stars and you would like to play for real? They are offering their players a wonderful first deposit bonus of 100% up to €100! This bonus offer apply’s on your minimum deposit of €10 and offer a wide range deposit methods such as Neteller or Skrill. If you need help their friendly support is available 24/7. 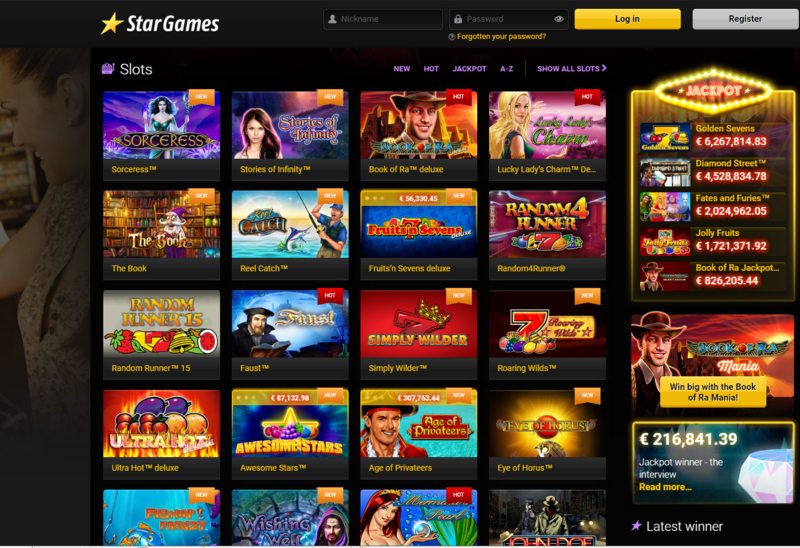 If you are looking for a casino with lots of promotions, then Stargames might not be the one for you. Once in a while, they are offering the player a special offer like for Christmas to give you a quick example. But your Loyalty will be rewarded at Stargames, as they are giving each player a monthly bonus based on your status, so the more you play the higher your bonus will be. If you getting a higher status this also means more benefits like having your own account manager or faster payouts of your winnings. On your birthday they also reward you with a nice bonus and this is nice because such bonuses are very rare these days. Stargames is a really nice no download site and beside that, you can play all your favorite land based slots for free or for real money. You also have the chance to take a sneak peak how other players are doing. Simply log in to your Stargames account and start a random novo slot you like. You will be entered into a special lobby with seats and where other players are playing. Simply click on a taken seat, to find out how someone is doing or take an empty seat if you want to play just by yourself. It is really a nice feature and also great to check out how the big winners or players are doing. Lowdepositcasinos.com has been created by someone from the Netherlands who has a passion for Gambling without spending too much money.